Devi (Chennai, India) on 3 October 2017 in Plant & Nature and Portfolio. Quelle plange qui tourne et vue ce vert, ce jaune sueprbe compo. On dirait que la fin de production arrive. A wonderful sense of 'life' somehow ! @Ronnie 2¢: :)) I know Ronnie loves green !!!! Great framing of the leaves . I love their frilly design and deep veins!! Pretty dark green which will contrast well when pumpkins grow. Beautiful capture of pumpkin leaves from a temple garden. I like the contrast between the two greens. A nice shot of the big healthy leaves. Very beautiful and healthy leaves! Will you show us the pumpkins soon? Lots and lots of leaves! Next year I would like to try and grow a pumpkin in my back yard. I will lots of room! A great image! are there any pumpkins hiding under there, or have they all gone to market? @Harry: No Harry..The flowers were there here and there !!! Nice photo of the leaves. 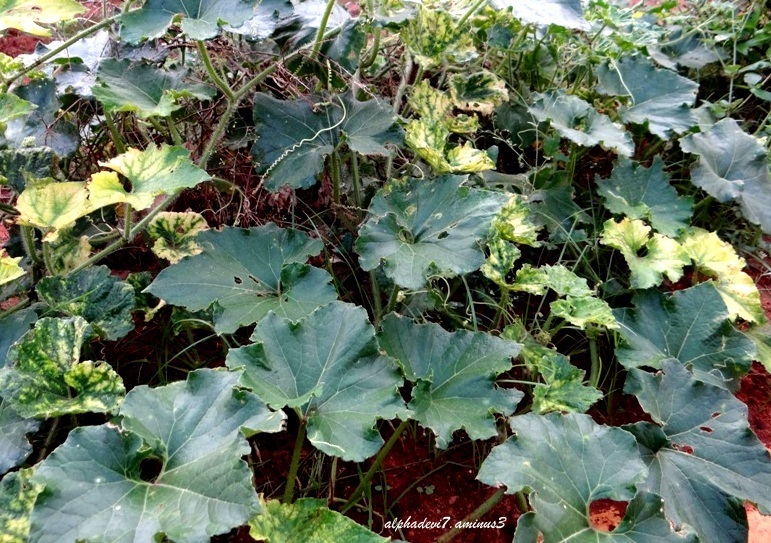 I like the different patterns of the pumpkin leaves.